Whether you are studying, doing some demanding projects, or simply working too much, chances are you are on a quest to be as productive as possible. I know I am. And, it’s not a secret that many people with busy schedules use supplements in order to get their best out of every day. Think caffein, it’s a supplement. There are many mental performance supplements on the market. They are referred to as nootropics. 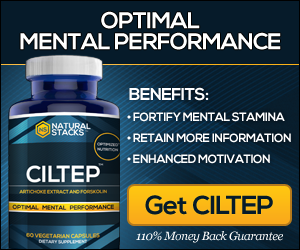 In this post, we will talk about the nootropic CILTEP that comes from Natural Stacks. This supplement is a very popular choice among those who want better focus and concentration. People that want a boost in order to achieve their goals. In this post, I will bring you a detailed review on this interesting supplement. It will give you focus and energy for crushing your deadlines, and will also give you clarity of your thoughts. For those of you who aren’t completely sure what nootropics are, we’ve got you covered. Nootropics are supplements that influence our brain in a positive way. Meaning, our focus, concentration, creativity, and memory will be improved. Nootropics help in strengthening the communication between the neurons in our brain, which will create more space for learning. This also means that our attention span will be increased and enhanced. Basically, our mental energy will be increased. Now, what makes this product (CILTEP) stand out from the crowd of Nootropics? Well, let us start with the fact that this brain supplement is all natural. Obviously, this is a good thing, since many of these supplements on the market aren’t all natural. When the supplement you’re taking contains synthetic ingredients, it will have little scientific support, so basically, you are the one who risks your health. You don’t have to worry about that with the CILTEP supplement. As we have already discussed, it is made with no synthetic ingredients. Not only that, but the ingredients in CILTEP will enhance positive effects, and will also minimize side effects. As you probably already know (if you’ve been taking nootropics) many of these products contain a plethora of different ingredients, some having up to 20-30 ingredients. This is because manufacturers are desperate for making supplement stacks that will have everything one could possibly need. However, in reality, having everything under the sun isn’t necessary. Meaning, there is no need to put so many ingredients into a product, because not all of them will have the dosage that your body can benefit from. Which, most companies won’t tell you. What they will tell you, is they have a list of ingredients but they can’t share the amounts with you. So, what I’m saying is, in most cases, less is better. The CILTEP product contains vitamin B6, L-Phenylalanine, Artichoke Extract, Acetyl L-Carnitine and Forksolin. These 5 ingredients make this supplement very powerful. I’ll talk about why in just a second. But first, let me talk about the reason this product was made. In 2011, a few very smart people from Longecity were discussing online what ingredients would make the very best nootropic. Naturally, these great minds started making a list of ingredients and after some time the formula for the CILTEP was created. The person who started a discussion was Abelard Lindsay, and he was also the one who took action, and made this formula happen. Which leads us to the next part of this article – the company’s mission. Natural Stacks products have become very popular, thanks to their reliability and positive effects. The company’s mission is to deliver innovative formulas that contain all natural ingredients that are clinically supported. In addition, Natural Stacks is the first open-source supplement company. Meaning, they will gladly put the ingredient list that shows the exact amount of the ingredients on their labels. Thanks to this, you will always know what you are consuming. Finally a completely transparent supplement company! The company believes that health cannot be compromised, thus they create products that will help you reach your brain’s full potential without causing damage to your body. Ok, so, what does CILTEP do? The CILTEP product represents a mix of powerful ingredients that will help you stay alert, have a better focus, and have better concentration. Also, your memory will be improved, due to better mental sharpness. Not to mention, your motivation will be increased, you will work/study faster, and it will feel easier. In addition to all of that, users say… you will find that it’s easier to successfully handle all of your daily tasks. But, how does this supplement does all of this – you ask. It is made in such a way that induces long-term potentiation (LTP) in your brain. LTP refers to the main mechanism that helps firming up neural synapses and forming new memories. The five ingredients in CILTEP will activate LTP and increase levels of cAMP (system in your brain that relays signals). Elevated cAMP levels in your brain lead to enhanced memory, memory formation, as well as concentration and motivation. Now, let’s take a closer look at the ingredients specifically. Vitamin B6 has a significant role in keeping our body and mind healthy and happy. This vitamin helps our bodies sustain a healthy nervous system, produce the neurotransmitter dopamine, boost energy, make hemoglobin, keep blood sugar levels optimized, and enhance our immune system. On top of all that, vitamin B6 has a positive impact on our mood. This is an essential amino acid that your body cannot function without. This amino acid is crucial for building protein in your body. There are two ways for your body to obtain the right dosage of this amino acid – through food sources (such as milk products, meat, oats, etc.) or through supplementation. L-Phenylalanine helps with the production of dopamine, epinephrine, and norepinephrine – neurotransmitters that are crucial for keeping your nervous system healthy. This amino acid also has been known to enhance mood and focus, boosting energy levels, AND combating stress. This is a chemical found in the plant Coleus Forskohlii. It has been used for a ages in Indian Ayurveda medicine, and as such has tons of benefits. Some of the benefits are increased cAMP in the brain. As already mentioned, increased level of cAMP means better memory formation and long-term memory. In addition, this chemical has been reported to decrease fatigue symptoms, helping you stay alerted and focused on the task at hand. Acetyl L-Carnitine is an amino acid that our body naturally produces. It helps our body stay energized by way of improving energetics in the cell’s energy generator. According to numerous studies, this amino acid has been associated with better cognitive ability, enhanced mood, and improved memory. In addition, it has been known to decrease chronic fatigue in healthy people, which leads to a better sleep quality and more energy. Last but not least. This ingredient is what makes CILTEP a powerful supplement combination. Artichoke extract is not commonly found in other supplements, which is a shame because there are so many great things about this extract. Artichoke is a plant that contains Luteolin – a natural inhibitor of PDE4. PDE4 is responsible for breaking down cAMP molecules, and because of that… it is not surprising that this extract contributes to better long-term memory, neuro-protection, and increased cognition, as well as alertness. We just want to mention that, since this supplement is all natural, well, it doesn’t contain soy and gluten. Furthermore, it is non-GMO, vegan and paleo friendly. You can get 10% off by using the code ALLAROUNDJOE at checkout. Now, the benefits – it comes as no surprise why this is one of the most popular brain supplements on the market. Let’s sum up the benefits of this products and then we will talk about its negative sides. Compared to similar products on the market, this one doesn’t have any side effects. Sure, it is not perfect, but this supplement is reliable and does what is supposed to do, without having a negative impact on your body or brain. Of course, you should always take it as prescribed, AND ask your doctor before taking any supplement. A slight issue is that this nootropic doesn’t have an immediate effect on your energy level. Meaning, we love caffeine because we get a kick of energy right away. Well, that is not the case with CILTEP. So, if you have an exam that you have to study hard for, make sure to take the supplement first thing in the morning in order to feel its benefits completely. Considering its benefits, and zero side effects, this nootropic is used by thousands of students, doctors, CEOs, scientists, artists, leaders, and workers all over the world. The best time for taking this supplements is upon waking. However, we are all different, have different schedules and wake up at different times. Because of that, some people prefer taking this supplement in the afternoon, even though the manufacturer doesn’t agree with that. When taking CILTEP later in the day, sleep quality may be hindered, which is not something I recommend doing. So, I recommend sticking to first thing in the morning. As for the dosage, the maximum amount of capsules that you can consume per day is 3. So, make sure not to take more than that. Take 1-3 capsules upon waking. The manufacturer advises taking one or two days off each week. Well, there you have it, an in-depth review on one of the best nootropics out there (that I know of). With all the benefits that this supplement offers… your focus will be much better, your energy level will be higher, and you will feel motivated. It seems like a no-brainer to give it a try. Let me know if you have any questions, and what you think of the product. *above could be affiliate links. I get a small commission if you click through them and buy, but they in no way make the products cost anymore. If you decide to use them please let me know so I can thank you.